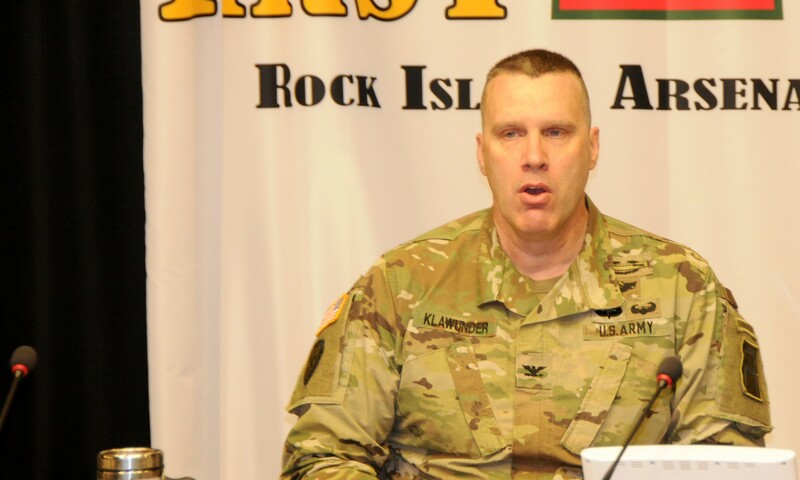 ROCK ISLAND ARSENAL, Ill. - First Army brought its new brigade and battalion commanders, command sergeants major, and Senior Advisors to the Army National Guard here Oct. 23-26 to better equip them to carry out their duties. Attendees were given an overview of First Army's mission and multi-component structure. This is necessary since some newly assigned Brigade and Battalion command team members and SRAAGs have never worked directly with Reserve Component units and Soldiers. This event, then, enabled them to understand the characteristics of First Army's mission and facilitate their integration into the command. 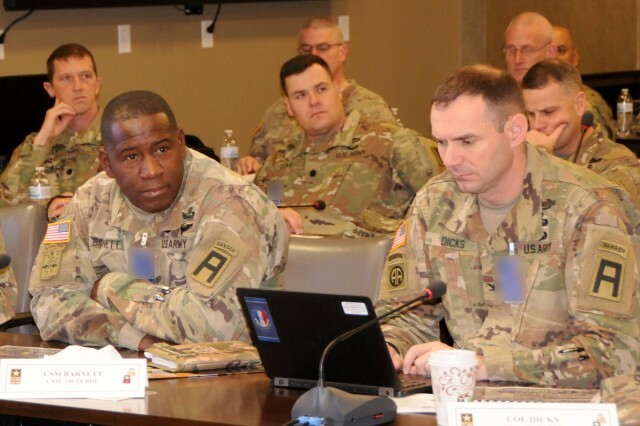 First Army began including SRAAGs in the orientation three years ago because of the key role they play in helping First Army execute its mission to train Reserve Component Soldiers. Each state and territory has a SRAAG whose mission is to provide military advice and assistance to the state's Army National Guard commanders concerning organization, operations, training, and readiness. Bringing SRAAGs and commanders together can be crucial because SRAAGs give battalion and brigade commanders someone in their state who can champion their cause and help them meet the commanders' intent. 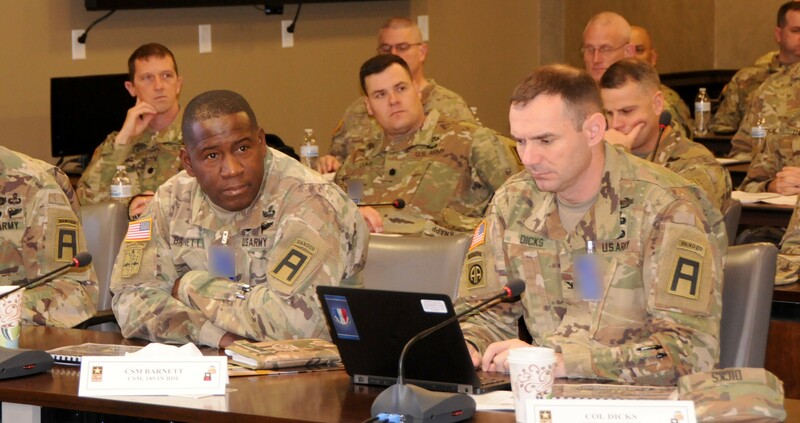 Key topics of the orientation included Army Total Force Policy, which requires the Army's active, Reserve and National Guard components to train to the same standard and operate toward a common goal. Attendees were also given an overview of First Army, the Reserve Component, training support synchronization, and the mobilization process. Col. Shawn Klawunder, First Army chief of staff, stressed the importance of open dialogue during the orientation. "I was a brigade commander in First Army a few years ago and I know from the brigade commander's perspective, as well as the sergeants major and SRAAGs, you're coming into this situation somewhat unfamiliar to you," he said. "So we really appreciate the opportunity to have you here. Please feel free, whatever questions you have of me, or anyone on the staff, ask those questions. The discussion will get us more out of this than anything else. There are veteran primary staff directors here to answer whatever questions you have. The question you want answered is somewhere in the room." Meanwhile, Col. Jason Joose, First Army deputy chief of staff for G3/G5/G7, outlined First Army's primary focus areas. "There are three priorities within First Army, the first of which is the (Mississippi Army National Guard's) 155th Armored Brigade Combat Team mobilization," Joose said. "Our job is to take them from their current level of readiness to being able to move out into theatre and be prepared to execute missions of behalf of Central Command. "The second is First Army's transition to focused readiness units. Those units are the Army's top priority right now. Focus readiness is a program designed to increase and enhance readiness of select units to be prepared for any contingency operations. "The last major priority we have is Mobilization Force Generation Installation expansion. That is where RC soldiers go to execute training specifically tailored to their mission and then they go off to theatre." 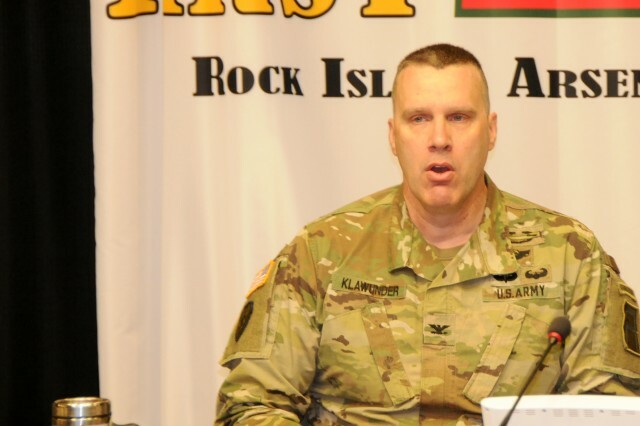 Lt. Col. Matt Giertz, West Virginia SRAAG, said the orientation equipped him with the knowledge to perform his duties. "There have been some really good information of tactics, techniques, and procedures," he said. "What I've gained form this is a good baseline foundation on processes, points of contact, and things we need to be aware of or involved with when dealing with our state representatives or networking with other SRAAGs and First Army-partnered units." Giertz is relatively new to his position so the orientation came at a good time for him. "I've been a SRAAG for two or three months and I've been studying and reading to get ahead, and this orientation helps reinforce some of the focus areas," he said. "We have a wide scope of responsibilities and this helps to better understand them and understand how they are related." He also found the orientation's structure to be beneficial. "We started out with the new command teams and got overview and had integration with them," Giertz said. "And the last couple of days were breakout for SRRAGs on topics that impact our primary roles and responsibilities are. There has been a lot of good information put out and this has been a valuable experience."